French painter, initiator, leader, and unswerving advocate of the Impressionist style. He is regarded as the archetypal Impressionist in that his devotion to the ideals of the movement was unwavering throughout his long career, and it is fitting that one of his pictures-- Impression: Sunrise (Musée Marmottan, Paris; 1872)--gave the group his name. His youth was spent in Le Havre, where he first excelled as a caricaturist but was then converted to landscape painting by his early mentor Boudin, from whom he derived his firm predilection for painting out of doors. In 1859 he studied in Paris at the Atelier Suisse and formed a friendship with Pissarro. After two years' military service in Algiers, he returned to Le Havre and met Jongkind, to whom he said he owed `the definitive education of my eye'. He then, in 1862, entered the studio of Gleyre in Paris and there met Renoir, Sisley, and Bazille, with whom he was to form the nucleus of the Impressionist group. Monet's devotion to painting out of doors is illustrated by the famous story concerning one of his most ambitious early works, Women in the Garden (Musée d'Orsay, Paris; 1866-67). The picture is about 2.5 meters high and to enable him to paint all of it outside he had a trench dug in the garden so that the canvas could be raised or lowered by pulleys to the height he required. Courbet visited him when he was working on it and said Monet would not paint even the leaves in the background unless the lighting conditions were exactly right. 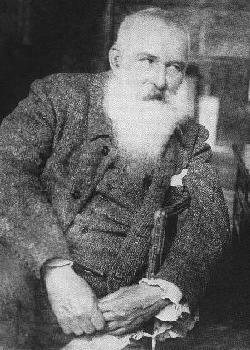 During the Franco-Prussian War (1870-71) he took refuge in England with Pissarro: he studied the work of Constable and Turner, painted the Thames and London parks, and met the dealer Durand-Ruel, who was to become one of the great champions of the Impressionists. From 1871 to 1878 Monet lived at Argenteuil, a village on the Seine near Paris, and here were painted some of the most joyous and famous works of the Impressionist movement, not only by Monet, but by his visitors Manet, Renoir and Sisley. In 1878 he moved to Vétheuil and in 1883 he settled at Giverny, also on the Seine, but about 40 miles from Paris. After having experienced extreme poverty, Monet began to prosper. By 1890 he was successful enough to buy the house at Giverny he had previously rented and in 1892 he married his mistress, with whom he had begun an affair in 1876, three years before the death of his first wife. From 1890 he concentrated on series of pictures in which he painted the same subject at different times of the day in different lights--- Haystacks or Grainstacks (1890-91) and Rouen Cathedral (1891-95) are the best known. He continued to travel widely, visiting London and Venice several times (and also Norway as a guest of Queen Christiana), but increasingly his attention was focused on the celebrated water-garden he created at Giverny, which served as the theme for the series of paintings on Water-lilies that began in 1899 and grew to dominate his work completely (in 1914 he had a special studio built in the grounds of his house so he could work on the huge canvases). In his final years he was troubled by failing eyesight, but he painted until the end. He was enormously prolific and many major galleries have examples of his work.